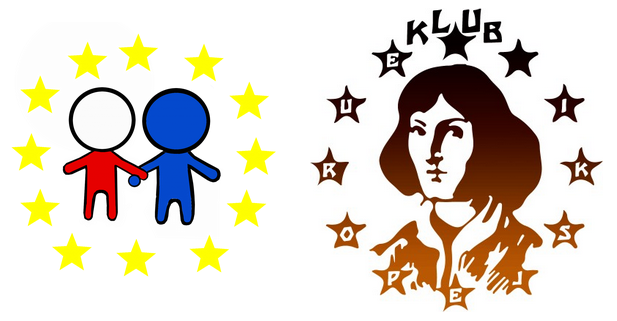 Szkolne Koło Europejskie prowadzą: p. Anna Cholewa – Purgał, p. Katarzyna Kornecka – Nalewajka oraz p. Małgorzata Korpus. Hi, my name is Julia and last year I turned 18. 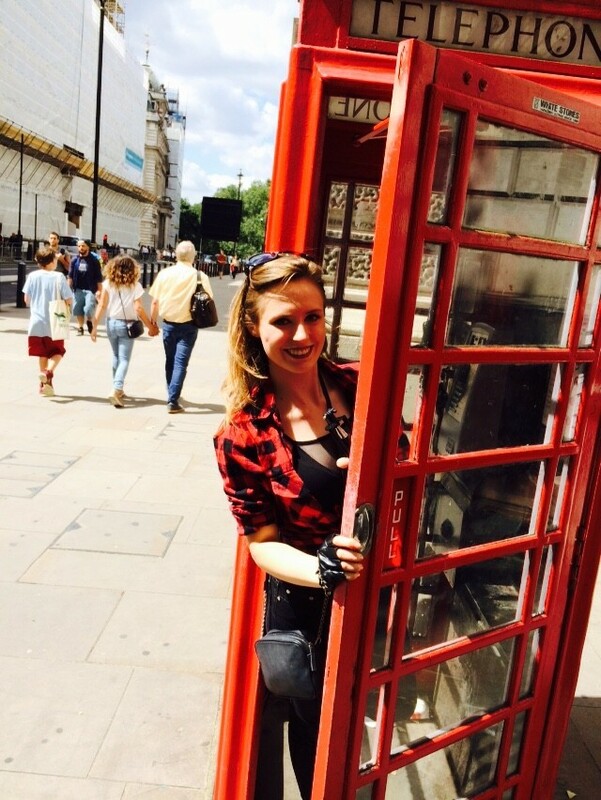 On 28th June me and my boyfriend, Gregory, had a flight from Katowice to London Stansted. Our target was to find a job for the summer holiday. At the airport our friend, Dan, was waiting for us. It was about midnight… At 3 a.m. we finally got to Boston, the town we had planned to stay in. Our friends, Kelly and Dan, are engaged and they live in a pretty new house ‚Chestnuts Homes’ with an amazing view on the Boston Marina River. There was something else: Kelly was pregnant then, and soon she was to give birth to their son – Liam. So we were living in a quite small flat with a pregnant girl, a father-to-be, and a cat. Also, in the middle of July Kelly’s twin, Amanda, was coming. In conclusion, 5 people plus the coming baby and a cat in a small home. On the first night after our arrival we were sitting and talking with each other from dusk to dawn. Unfortunately, Kelly and Dan’s predictions proved incorrect. Days were passing, time was being wasted, money was running out, and we didn’t have any work. On 4th July we went to another agency to ask about a job in another factory. 3 days later we woke up and went to the next induction, which was the same as the previous one: tests, forms, and short films. After the second long induction we did the same things as every day: shopping, making dinner, cleaning after all, and spending some time with Kelly and Dan. I went into the cold assembly for the first time, cleaned up my hands again and put on a pair of sleeves, gloves, and an apron, which were all made from aluminium foil. The team leader told me to ‚go on base’, which means that I was to be putting frozen bases on the lane for 7 hours. That was a real nightmare. I wanted to go to sleep, I was cold from the frozen pizza bases, and I really had no energy to work. My job was boring! I was doing the same thing all night long and I was freezing! The nightshift ended at 6 a.m. and I had never been so exhausted before! But I was proud of myself as I endured the whole night in the first job in my life. Me and Gregory both worked, and, as a result, our lifestyles changed. We slept during the day and worked at night. In the course of time I got used to my job, but during the days I really wanted to change it. I liked the work on the assembly because spreading the ingredients like spinach, pepper, bacon or sauce was a pleasant job to do, and so was adding chicken, which was, none the less, more complicated because it involved working with weight while the line with pizza was running on. In my opinion the assembly was the most pleasant area to work at, and there were always people to talk to while working, so that good vibes made me do it all night and that was the most interesting job to do in the factory. One week later the beautiful English weather made me sick. While the temperature outdoors reached about 25 – 30 degrees Celsius, the temperature at work was from 3 to 10 degrees Celsius. I got ill. Cough, flu, and high fever. But for the people working in the agency it didn’t matter. I had to go to work because ‚they didn’t have people to do the job’. Try to imagine working in a really low temperature having high fever, cough, and flu, and, mind you, I was working with food! In my opinion, if I were to work with food, I had to be healthy, but, apparently, the work agency didn’t quite share my opinion. After 2 or 3 days one of the team leaders eventually got to know that I was sick, then argued with the agency and after that day at work, I got one day off. Our first pay was to be transferred to our bank account and accessed by a debit card, which the agency had to give us, but after three weeks the agency still hadn’t given us cards. So, we had our first paycheck in cash, and the second payment was finally by card. But it wasn’t the only surprise concerning money. We discovered that a pick up to work cost 5 pounds, which was the pay for our first working hour, and also that we could end work earlier, if ‚they didn’t need people’, so sometimes we were sitting in the canteen from about 2 or 3 a.m. to 6 a.m., waiting for a pick-up home. We had been working two weeks in Vakkabor when we had to move out from Kelly and Dan’s place. Me and Gregory paid for our room 100 pounds a week. So our money ran out after we had paid for the room, the pick-ups, and sitting at the canteen. We were feeding ourselves with the cheapest products, as we wanted to save as much money as we could. After a while I started enjoying my work on the assembly but the agency would regularly displace me and Gregory to work at the bakery, high-risk, or packing area. The bakery was a place where employees were doing the same things all night, which included rolling pizza rims and cleaning the space. At high-risk it was very cold, mostly because of working with frozen bases, and there was nothing more to do than keep putting pizza bases on stacks. In my opinion the packing area should be manned only by males, because this work needs much physical strength: you make boxes, pack pizza, and hoist boxes there. I soon discovered that working in a factory and being a person from the agency isn’t easy. People can’t get a day off, and sometimes don’t know if they are to go to work because the agency sends messages which sometimes never reach you, are sent to a wrong number or get delivered too late. Sometimes you find out that you’re not needed at work only when you’re being picked up by the employer. That’s a huge problem. 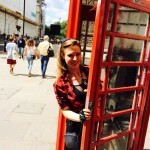 All in all, my work in Vakkabor and life in England were a life changing experience. It has taught me that life is not as easy as we, teenagers, expect. I had imagined that I would bring thousands of zlotys home, would do my job happily with a smile on my face, would sleep a few hours and have all day to spend, and that it would all be so enjoyable. How was it in real? My job was not difficult but dull and tiring, the payment was low and it was hard to earn the living. Me and Gregory had a lot of negative surprises and had to go together through so many obstacles to finally break up… Who would have expected it? Not me, but I am thankful for all that I have learnt. 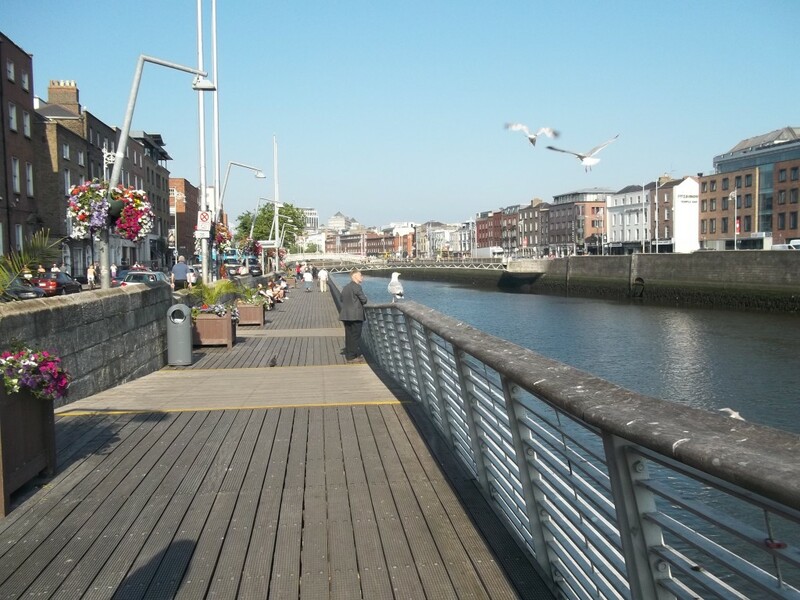 I had a great opportunity to visit Ireland during my last summer holidays. I would like to share with you some of my memories from that wonderful island . I hope you`ll find them worth reading. Ireland as a country is 4.5 times smaller than Poland and it has only 4.6 million inhabitants – so 9 times fewer than there are here in Poland. Undoubtedly, it is one of the most beautiful countries I have ever visited in my life. We often refer to Ireland as ‘An Emerald Island’ – since from the bird`s-eye view it looks like a huge emerald stone dropped in the middle of the ocean. The most interesting city of Ireland is Dublin. 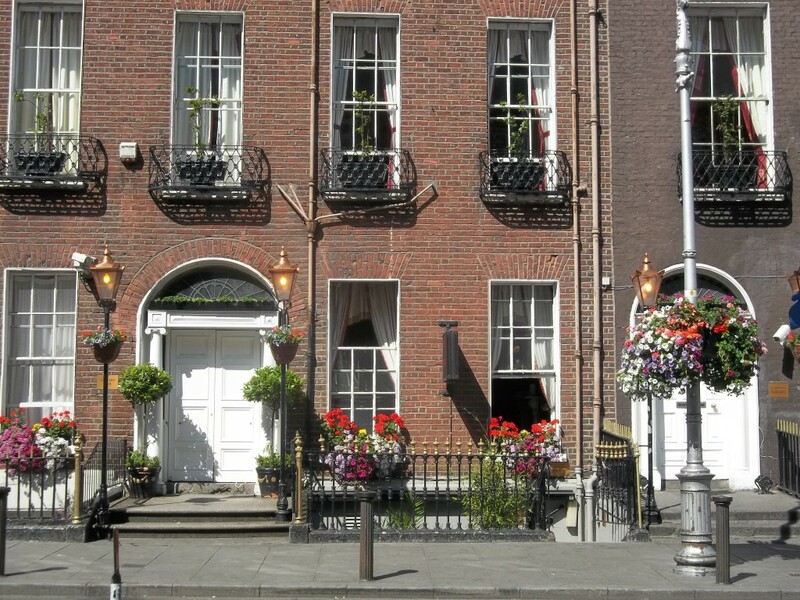 It is the capital city of the Republic of Ireland situated in the east part of the island on the river Liffey. 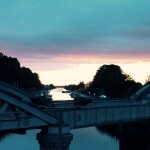 The word DUBLIN (the Irish pronounce it: [dʊblɪn] ) derives from the Gaelic words Dubh Linn and they mean “Black Pool”. As a city, it is disproportionately large for the size of the country; however its centre is relatively small and can be navigated on foot. So I used my feet and this is what I saw there. The first place I had a chance to see properly was O`Connell Street – the very heart of the city, where the life of the Dubliners is concentrated. 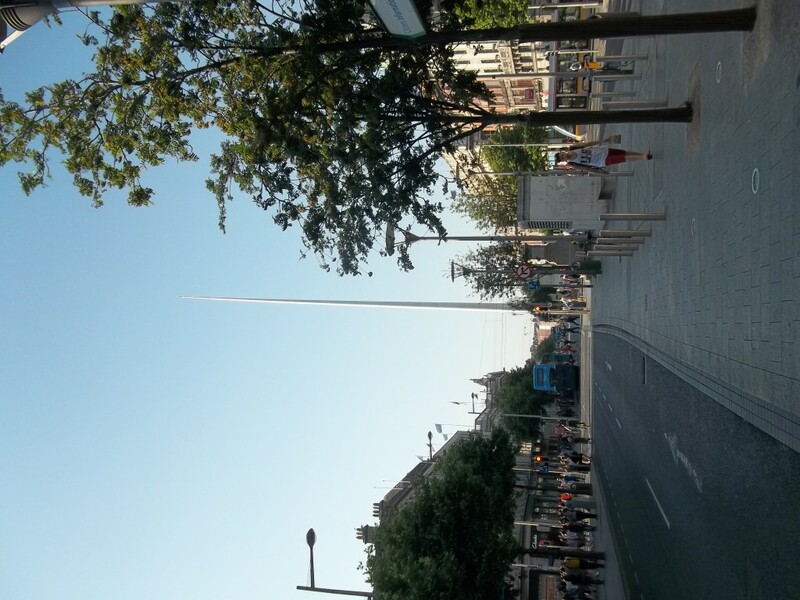 There you can see a sparkling Monument Of Light, (alternatively called The Spire of Dublin), a 121-meter-high landmark seen from many kilometers away from the city. Walking along the street you would hear many Polish people passing by. I had an impression that Polish is the second language spoken in Ireland. People from all walks of life have come to Ireland in search of work and a better life. Just after I crossed the bridge on the river Liffey and walked on a little bit in the north, I arrived at the main entrance of Trinity College. When I passed through the main gate I left a busy and noisy street behind and came into a completely different, peaceful world of Trinity College. I could feel its 400-year history and see as its lawns, thick as old Persian carpets. All astonishing. 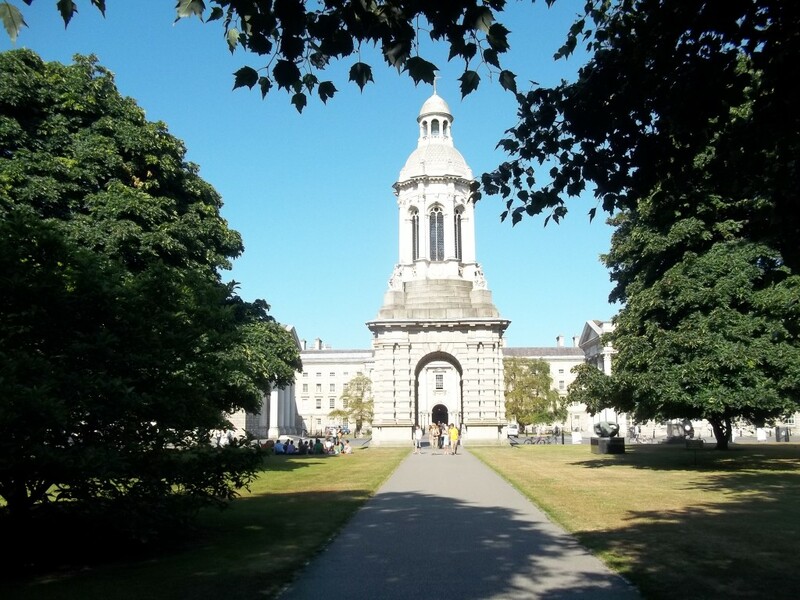 Trinity College is the home for the Irish 12-hundred-year-old sacred ‘Book of Kells’. 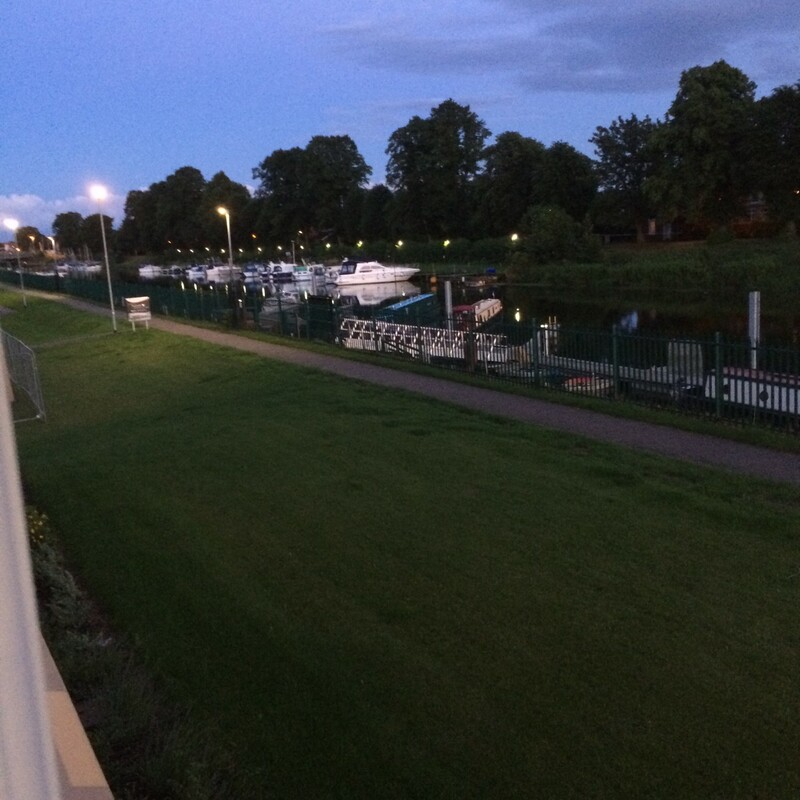 Even in that compound I was able to notice the changes that are present in Ireland. Next to the old buildings completely new ones have been recently built to serve students. 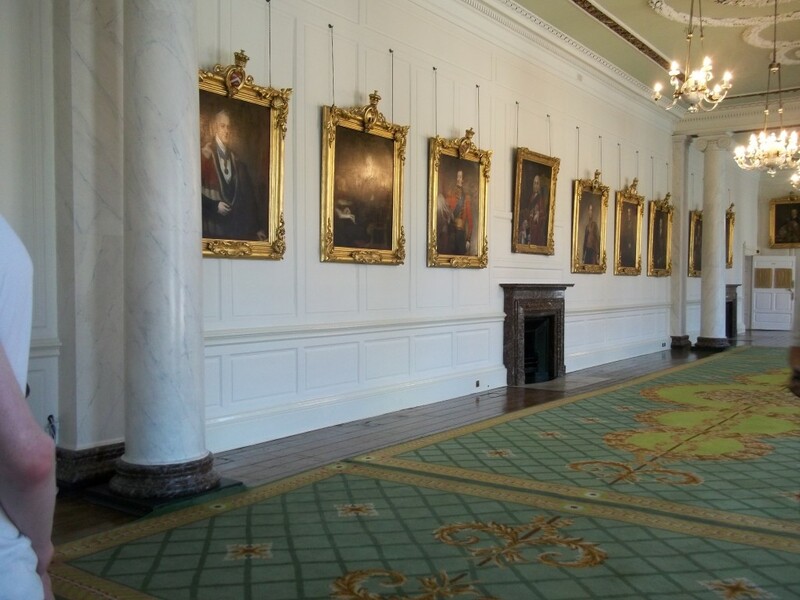 During my stay there I also visited Dublin Castle, where an Irish guide told me all about the difficult and sometimes tragic history of Ireland. The castle was a silent witness of countless executions of Irish men. The British had ruled the island for more than 500 years and left the southern part of it in 1922. Wandering around I also popped into Saint Patrick`s Cathedral, which was built in 1220 and is very old. 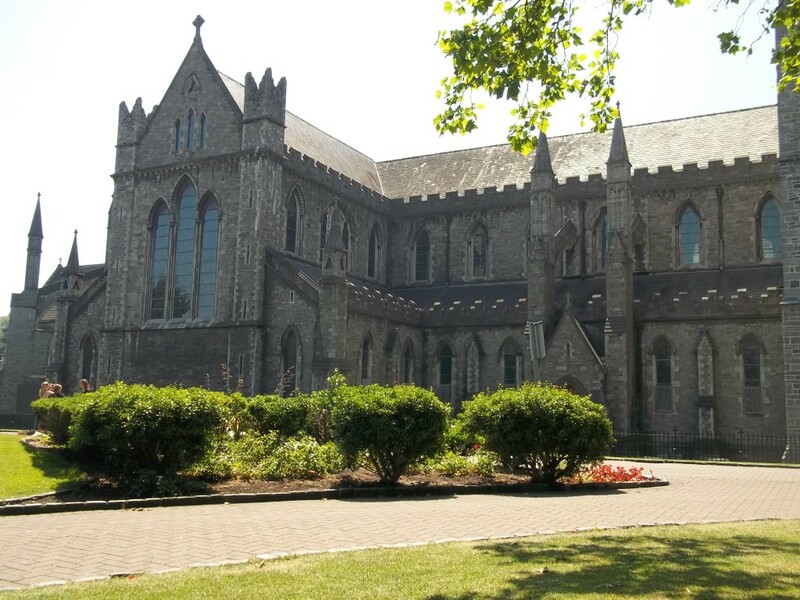 The Cathedral is today the National Cathedral of the Church of Ireland. Saint Patrick is also the patron of Ireland. 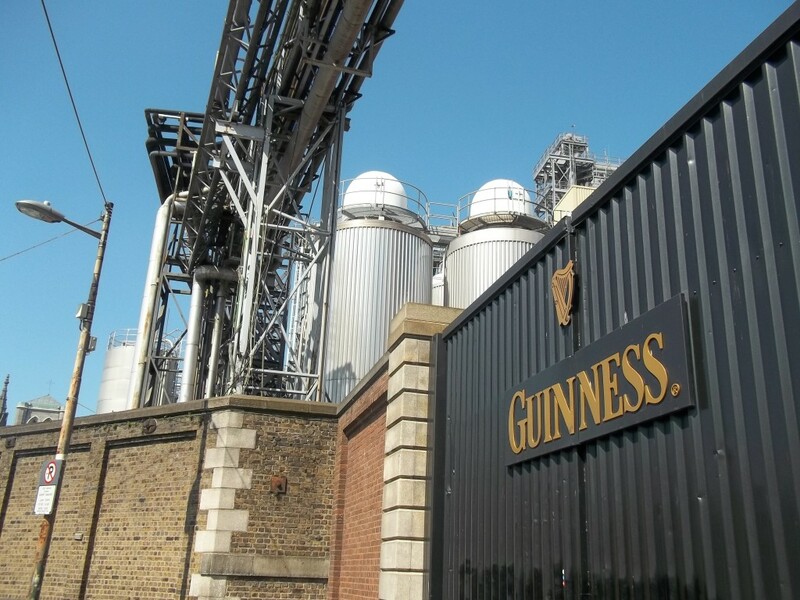 Visiting Dublin you can`t miss the plant of famous Guiness ale (beer), which is situated in the same centre of the city. There I could see the museum of this popular drink and see how it is produced. I really recommend it. Truly worth seeing. An interesting fact I heard during my stay refers to both Guiness and Ireland. The harp is the symbol of the Republic of Ireland and of the Guiness company. But they are not identical. When the harp was adopted as the emblem of the Irish Free State when it separated from the United Kingdom in 1922, the people decided it must face left while the Guiness` harp faces the right side. And this way they were registered. Visiting Dublin I couldn`t omit its modern part, which used to be abandoned, neglected and left unattended for many years: the old docks. Situated at the same mouth of the river, this district is now full of quite modern glass and metal buildings, which stand next to the renovated warehouses, preserved and saved from demolishing. 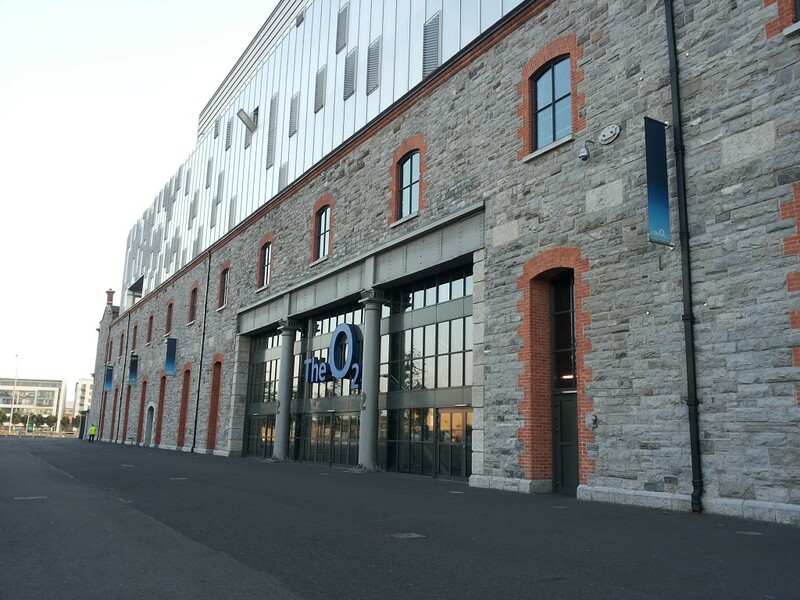 There are beautiful apartments and fancy hotels there, and, of course, the huge O2 Arena (a concert hall). 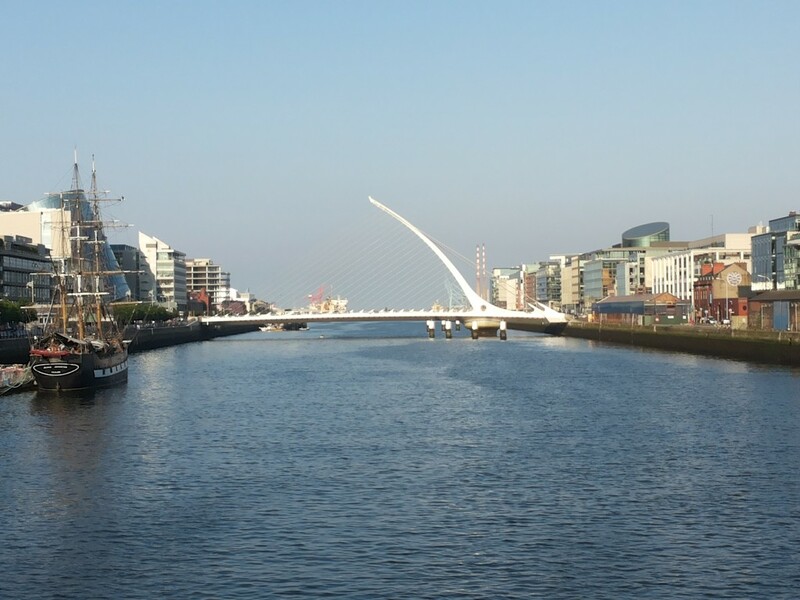 The most beautiful symbol of this transition is the harp-shaped Samuel Beckett Bridge. 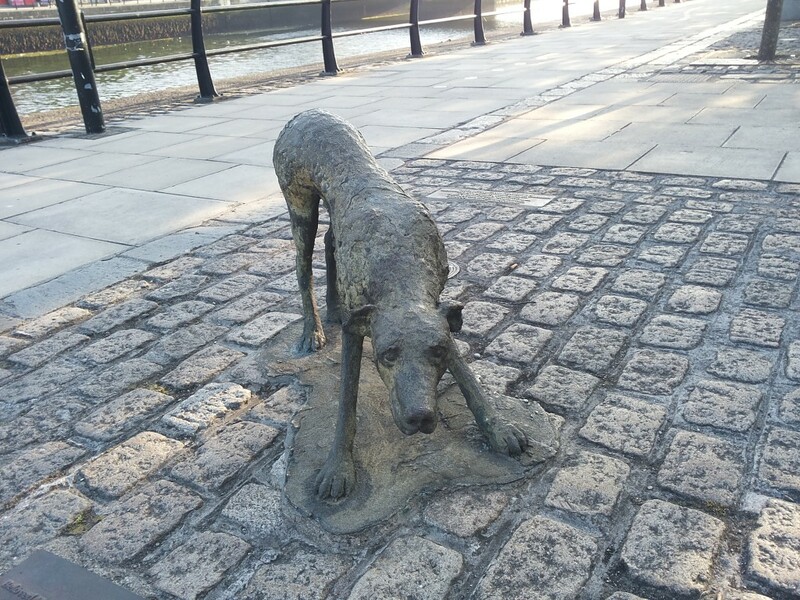 In the modern part of Dublin, just on the river`s bank, there is also a very moving sculpture compound built to commemorate those Irish people forced to emigrate in the 19th century during The Great Famine – another piece of Irish tragic history that must be remembered. About 10% of the Irish left island fleeing from hunger and poverty then. Sinead O`Connor, a famous Dublin artist, in 1995 wrote a song about that tragic fact from the Irish history and its title is ‘Famine’. Ireland seemed to me very green: green shamrock, green buses, green DART trains, green fields, even the leprechaun`s coat is green. ‘Green Island’ in every meaning. When my plane was taking off I was once again able to admire its beauty. And I will always remember Irish people who are very friendly, helpful and open. Of course, their English is sometimes completely different from what we are taught at schools. As I have mentioned, no respectful Irish would ever say [dʌblɪn] or [bʌs]. You would rather hear[dʊblɪn] or [bʊs]. On the other hand, when you expect to hear the sound [ʊ], you would sooner hear [u] than [ʊ] in words hook or took, for instance. The word ‘many’ sounds like nanny and ‘gave’ like ‘gev’. That is why Irish English is sometimes difficult to understand, especially by such an inexpert ear as mine. I visited many other interesting places there, but one article is not long enough to describe them all. Maybe in the future I will have the chance to do so. That is all for now. Szwajcaria, to kraj leżący w zachodniej Europie. Jest jednym z najlepiej rozwiniętych i najbogatszych państw. Przeważają tu tereny górzyste – Alpy zajmują południową, południowo-zachodnią i wschodnią część kraju. Szwajcaria słynie z rozwiniętej bankowości oraz najlepszej jakości zegarków i innych wyrobów z metali szlachetnych. Chociaż nie należy do Unii Europejskiej to wiążą ją pewne umowy dwustronne. Dodatkowo należy do strefy Schengen. Jest państwem neutralnym – od 1815 r. we wszystkich aktach prawnych znajduje się zapis o jej bezstronności. Szwajcaria jest typową demokracją bezpośrednią: co najmniej cztery razy w roku są organizowane referenda ogólnokrajowe. Niektóre z nich mają charakter wiążący, inne tylko konsultacyjny. Kolejnym przejawem demokracji bezpośredniej jest veto ludowe - minimum 50 tys. Obywateli może odwołać daną ustawę. Jest to państwo federalne, składające się z 26 kantonów cieszących się bardzo dużą autonomią. Na jej terenie obowiązują cztery języki urzędowe : francuski, niemiecki, włoski i romansz. • Ustawodawczą – tzw. Zgromadzenie Związkowe/Federalne. • Władzę wykonawczą sprawuje rząd zwany Radą Związkową/Federalną. • Władzę sądowniczą sprawuje Sąd Związkowy/Federalny składający się z 30 sędziów wybieranych przez parlament. Kraj torreadorów jest największym krajem spośród państw położonych na Półwyspie Iberyjskim. Graniczy z Portugalią, Francją, Andorą oraz należącym do Wielkiej Brytanii Gibraltarem, a miastem stołecznym jest Madryt. Na czele Królestwa stoi król Jan Karol I wywodzący się z dynastii Burbonów. Ma on dosyć szeroki zakres władzy, gdyż może rozwiązać każdą z izb parlamentu oraz nie podpisać ustawy; może mianować szefa rządu, który zawsze wywodzi się ze zwycięskiego ugrupowania, wygłaszać orędzia do narodu; jest również najwyższym dowódcą wojska. Juan Carlos I cieszy się szacunkiem i autorytetem wśród władzy i społeczeństwa, ale pełni głównie funkcję reprezentacyjną kraju. System polityczny Hiszpanii opiera się na konstytucji z 31.10.1978. Została ona uchwalona przez parlament czyli Kortezy, a zatwierdzona 6 grudnia 1978 roku w ogólnonarodowym referendum oraz w tym samym roku dnia 27 grudnia podpisana przez króla. Jej uchwalenie było możliwe dzięki demokratycznym przemianom, zapoczątkowanym po śmierci generała Franco w 1975. Konstytucja jest gwarantem demokracji i systemu rządów parlamentarno-gabinetowych. Parlament Hiszpanii to Kortezy i ich kadencja trwa 4 lata. Składa się Senatu (izba wyższa) i Kongresu Deputowanych (izba niższa). Senat liczy 259 senatorów, a Kongres Deputowanych – 350 członków. Aby móc korzystać z prawa czynnego i biernego w Hiszpanii należy spełnić warunki takie jak: pełnoletność (18 lat), brak występków i przestępstw przeciwko wyborom oraz nieprzebywanie w szpitalu psychiatrycznym w dniu wyborów. Francja jest republiką o systemie semiprezydenckim. Obowiązuje w niej Konstytucja V Republiki z 1958 roku z poprawkami wprowadzonymi w 1962 i 1995 roku. - decydowanie o użyciu broni atomowej. Rząd nazywany Radą Ministrów to organ władzy wykonawczej z uprawnieniami legislacyjnymi. Rządowi przewodniczy prezydent. Mianuje on premiera podobnie jak członków rządu (na wniosek premiera). Rząd musi uzyskać wotum zaufania przed Zgromadzeniem Narodowym. W przypadku gdy większość w Zgromadzeniu Narodowym posiada przeciwna prezydentowi frakcja obowiązuje zasada koabitacji, czyli współpracy między prezydentem a rządem wywodzącym się z opozycji. Premier stoi na czele Rady Gabinetowej, która przygotowuje posiedzenia Rady Ministrów. - prawo wystąpienia do Rady Konstytucyjnej z wnioskiem o zbadanie konstytucyjności ustaw i umów międzynarodowych. Zgromadzenie Narodowe składa się z 577 deputowanych wybieranych w wyborach powszechnych. Senat składa się z 348 reprezentantów wspólnot terytorialnych Francji, wybory do niego są pośrednie, a jego kadencja trwa 6 lat (co 3 lata odnawiana jest połowa składu). We Francji istnieje zasada równouprawnienia izb, czyli jeżeli jedna izba uchwali projekt prawa a druga odrzuci postępowanie legislacyjne uważa się za zakończone. Kto obecnie rządzi Francją ? Elżbieta II z dynastii Windsorów. Wielka Brytania jest państwem unitarnym, zdecentralizowanym z jednostkami autonomicznymi. W przeciwieństwie do większości państw europejskich Wielka Brytania nie posiada konstytucji (monarchia parlamentarna). - Konwenanse konstytucyjne, czyli utarte sposoby postępowania w pewnych sytuacjach. Głową państwa jest król, który jest organem władzy zarówno wykonawczej, jak i ustawodawczej. Władza ustawodawcza należy do dwuizbowego Parlamentu, w którego skład wchodzą Izba Gmin i Izba Lordów. Organem władzy wykonawczej jest gabinet. Teoretycznie uprawnienia monarchy są bardzo szerokie. W praktyce jednak decyzje podejmuje minister w imieniu monarchy lub monarcha na wniosek ministra (rząd/minister podejmuje decyzje należące do zakresu władzy monarchy, a głowa państwa musi je jedynie zatwierdzić oraz decyzje królewskie wymagają ministerialnej kontrasygnaty). Król ma prawo do udzielania rad, zachęcania, ostrzegania. Króla ograniczają również konwenanse, np. monarcha desygnuje premiera → urząd premiera obejmuje lider partii, która zwyciężyła w wyborach; każdy akt prawny wydany przez monarchę wymaga kontrasygnaty premiera oraz odpowiedniego ministra, dlatego monarcha nie ponosi odpowiedzialności politycznej. W praktyce posiada jedynie funkcje reprezentacyjne. - Składa się z lordów duchownych (biskupi anglikańscy) oraz świeckich, mianowanych dożywotnio przez monarchę na wniosek premiera, albo dziedzicznych. - Ma prawo weta zawieszającego w stosunku do uchwał Izby Gmin. - Pełni funkcję sądu apelacyjnego. - Liczba członków jest zmienna (ok. 650). - Obowiązują wybory powszechne, okręgi jednomandatowe. - Pojawiło się kolejne ugrupowanie – Liberalni Demokraci, które jednak nie odgrywa znaczącej roli. - Uchwala ustawy i budżet. - Kontroluje rząd, ma prawo uchwalić wotum nieufności wobec premiera, ministra lub całego rządu (w praktyce funkcja ta jest ograniczona, ponieważ premier jest równocześnie szefem partii, która dysponuje większością miejsc w Izbie Gmin). Parlament jest zdominowany przez Partię Pracy i Partię Konserwatywną (system dwupartyjny). RZĄD – cały aparat administracji państwowej opłacany ze skarbu państwa. PREMIER – stoi na czele gabinetu, lider partii zwycięskiej, Pierwszy Lord Skarbu, Minister ds. Służby Cywilnej, sprawuje faktyczną władzę w państwie, obsadza najwyższe stanowiska w państwie, dokonuje zmian w gabinecie, decyduje o rozwiązaniu parlamentu. Numer Dziesięć) to zapewne najbardziej znany adres w Londynie i jeden z najłatwiej rozpoznawalnych budynków na świecie. Jest to rezydencja i biuro premiera Wielkiej Brytanii oraz siedziba Rządu. PREMIERZY ZJEDNOCZONEGO KRÓLESTWA WIELKIEJ BRYTANII I IRLANDII PÓŁNOCNEJ OD 1979 r.
I really like travelling. Every year I travel all around Europe. I like it, because I can see many great places, I can learn something about other cultures and I can meet many interesting people from the whole world. One of the countries I’ve visited is Spain. Spain is a beautiful country. There are many wonderful places to visit there. That’s why I’ve been there not only once but twice. First time I went to Barcelona. It is huge. Too big to visit it on foot only. You have to use either buses or underground trains. However, a walk along La Rambla, the most famous street linking the Catalunia square with the quay, is just a must. Barcelona is beautiful. It’s full of clubs and museums. You can admire there works of famous Barcelona’s artist: Antoni Gaudi. He is the main architect of Sagrada Familia and this cathedral is the symbol of Barcelona. It hasn’t been finished yet and is still being built. Builders anticipate construction completion around 2026 and it’s construction started in 1883! Isn’t it amazing? Worth seeing there are also Park Guel, Picasso Museum and Camp Nou Stadium. Barcelona is located on the seacoast so besides visiting highlights we can also lay on a beach there and admire the beautiful Mediterranean Sea. The city beaches in Barcelona are really worth seeing: wide, sandy and clean. You can easily take a deep breath at Barcelona! In Catalunia people are energetic and full of invention. They create a big part of Spanish GDP but they want to separate from the homeland and make their own state. They want to become independent from Madrid. They still keep a wide range of rights (have their own language taught at schools or their own parliament, and they are defined as a nation) but still it is not enough for them. I really liked Barcelona and Catalunia so my next journey was made to Madrid – the very heart of Spain (the royal city with Palacio Real (Royal Palace) in the centre and the status of the capital city of Spain). I found Madrid completely different from Barcelona. Much more traditional and… old. Of course, there are quarters in the city where there are modern buildings (Puerta del Europa) as well, but the whole city makes an impression of stability and tradition. Where there are Joan Miro Gallery or Park Guell with modern art in Barcelona, in Madrid you find Prado instead: the gallery of old painting masters like Velasquez or Goya, and Parque Retiro. A completely different style and atmosphere. Still interesting and exciting. The must see places are for sure: Plaza Mayor, Puerta del Sol (in Spanish „Gate of the Sun”) and, finally, for all football lovers Santiago Bernabeu Stadium. I wanted to see more so I took two short trips to small Spanish cities Toledo and Segovia, which are very ancient and historical. The most characteristic building in Segovia is The Roman Aqueduct of Segovia. It is one of the most significant and best-preserved ancient buildings left on the Iberian Penisula . It`s present in the city’s coat of arms and looks very impressive. And if you learn that it was probably built in the 1st century AD – you begin to wonder even more. It’s astonishing. Although Segovia is not half as famous as Toledo, is much, much older. It was probably built by the Celts centuries ago! I managed to visit The Alcazar of Segovia – a fortress built in a very unique style. It’s been one of the inspirations for Walt Disney`s Cinderella Castle, for its architecture is excellent. The decorations there were made by the Arab workmen and are just exquisite. Toledo (the next city I’ve visited) is a very well known city located near Madrid. It is known as the „Imperial City” for having been the main venue of the court of Charles I, and as the „City of the Three Cultures”, having been influenced by a historical co-existence of Christians, Muslims and Jews. The architecture of the city is really beautiful. All buildings are old and classical. It is really nice to walk around the city and admire its beauty. But you can easily get lost in Toledo, so don’t ever dare visit it without a good map. The streets are very narrow and so winding, that you are never sure where you are. The last stop I made in Spain was in Alcalá de Henares – the birthplace of Spaniard – Miguel Cervantes, the author of Don Quixote. I had an opportunity to visit his renovated house. Just in front of it there is a little monument of his most popular character and his henchman Sancho Pansa. Alcalá de Henares has the largest community of Polish immigrants in Spain, with over 40,000 people. There you can also find one of the most noble universities in Spain, the University of Alcala. It is considered as the major landmark and greatest pride of the city. Its architecture is so beautiful that the building of the University in San Diego, California, was modelled on the University of Alcala compound. The name British Isles is a geographical term. It refers to a group of islands which are located off the north-west coast of Europe. The two largest islands are Great Britain and Ireland but there are more than six thousand islands and islets in this group. The British Isles are bounded by the English Channel and the Strait of Dover to the south, the North Sea to the east and the Atlantic Ocean to the west and north. Two sovereign states occupy the archipelago: the United Kingdom of Great Britain and Northern Ireland and the Republic of Ireland. The islands of GB and Ireland cover over 300,000 sq km, which is almost 75% of the total area of the archipelago. The United Kingdom is the name of a country located in the north-west of Europe on the islands of Great Britain and Ireland. Officially, the name of the country is the United Kingdom of Great Britain and Northern Ireland. 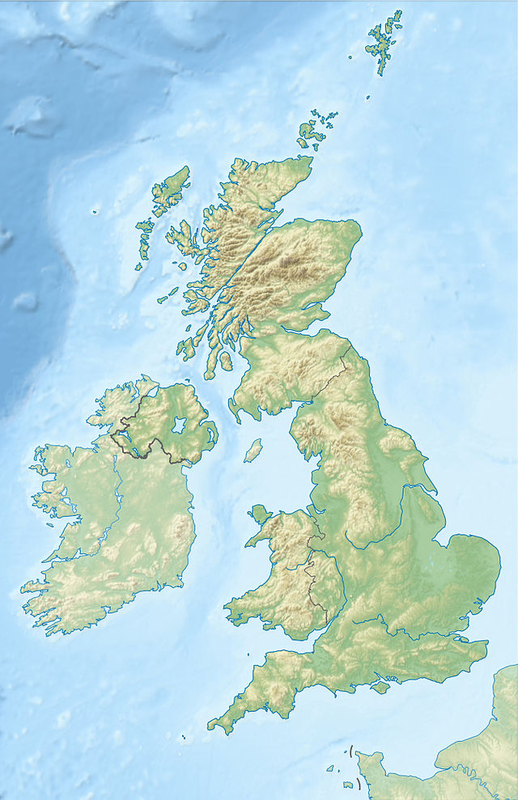 Three of its divisions – England, Scotland and Wales – make up the island of Great Britain, whereas the fourth division, Northern Ireland is located in the north-east part of Ireland. 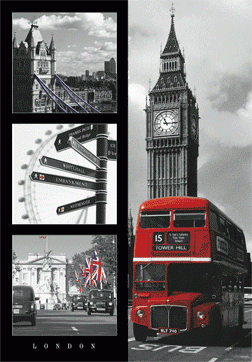 The capital of the United Kingdom and England is London. 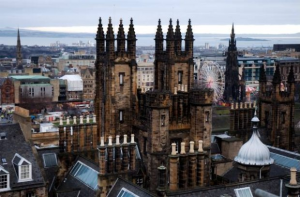 The capitals of Scotland, Wales and Northern Ireland are, respectively, Edinburgh, Cardiff and Belfast. The five largest cities of the United Kingdom are London, Birmingham, Manchester, Leeds, and Liverpool. The highest mountain is Ben Nevis which is 1343 meters above sea level, and the longest river is the Thames, which is 338 kilometers long. The largest lake in the United Kingdom is Lough Neagh at 388 sq km (Northern Ireland). 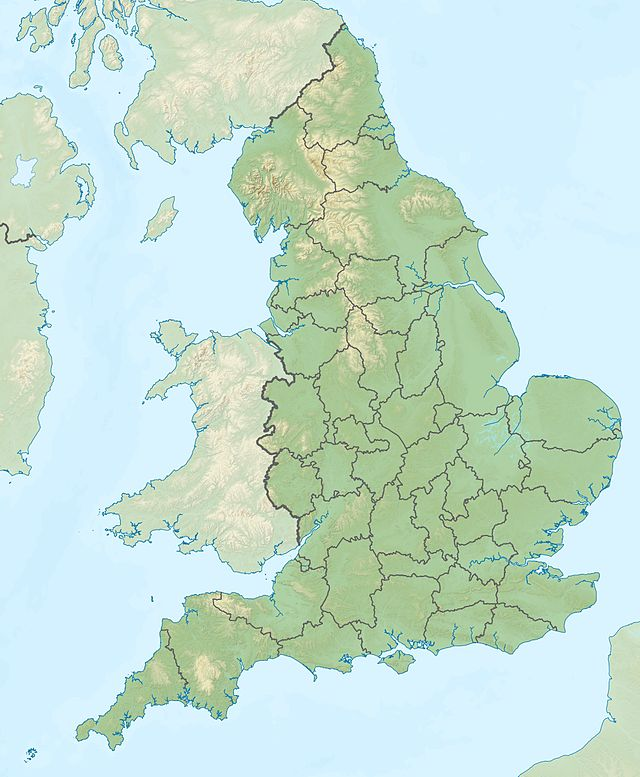 England is one of the three divisions which make up the island of Great Britain. Politically, it is one of the four countries which constitute the UK. England occupies two-thirds of Great Britain’s area. The total area of England is over 130,000 sq km. England has about 50 mln inhabitants and a population density of nearly 400 people per square kilometer. 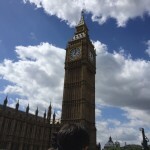 The capital of England is London, which is also the largest city. Other large cities include Birmingham, Manchester, Leeds, Liverpool, Sheffield, and Newcastle. 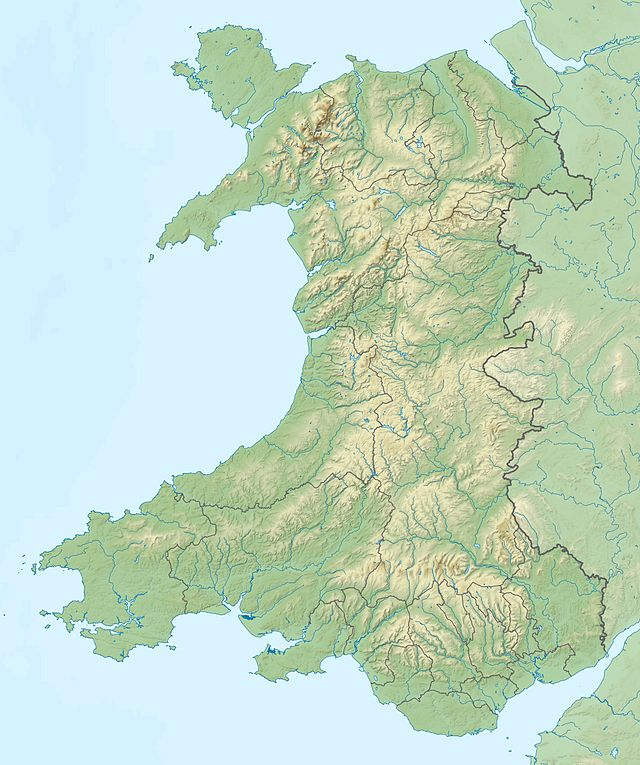 There are three main geographical regions in England: the Pennies, the Southwest Peninsula, which is a low plateau, and the English Lowlands, which have the greatest population and most farmable land in England. The typical English landscape is that of rolling hills. Scotland is one of the three divisions which make up the island of Great Britain. Politically, it is one of the four countries which constitute the UK. Scotland is located in the north of the island of Great Britain, and it occupies one third of its area. The River Tweed and the Cheviot Hills form the Scottish-English border. The total area of Scotland is over 78,000 sq km. Scotland is less populated than England and it has only about 5 million inhabitants. 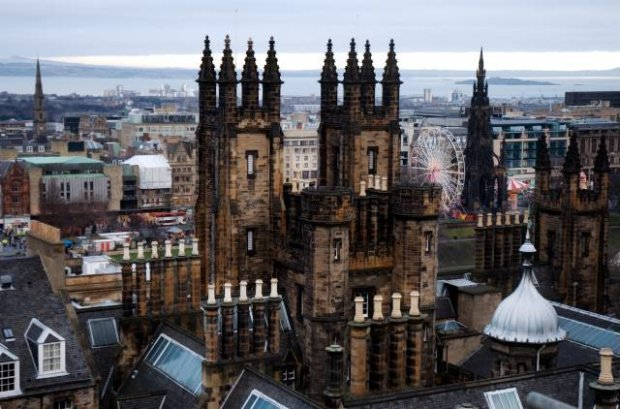 The capital of Scotland is Edinburgh, but Glasgow, with approximately one million inhabitants in its metropolitan area, is the largest city. Other large cities include Aberdeen, Dundee and Inverness. Scotland is divided into three main regions: the Highlands, the Central Lowlands and the Southern Uplands. The Highlands are two mountain ranges, the Northwest Highlands and the Grampian Mountains, which are located in the north of Scotland. Northern Ireland is the name of one of the four countries which constitute the UK. It is located in the north-east part of Ireland. The total area of Northern Ireland is 13,843 sq km. Northern Ireland is the smallest division of the UK – its population is only about 1.7 million. The capital and the largest city of Northern Ireland is Belfast with the population of about 275,000. There are only four more settlements with city status: Armagh, Derry, Lisburn and Newry. 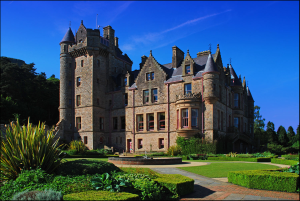 Northern Ireland is a land of low mountains and rolling plains which cover the central part of the country. Roman Ociepa, United Kingdom at a glance, Bielsko-Biała 2010. James O’Driscoll, Britain, Oxford 2001. Niemcy – państwo federalne położone w zachodniej i środkowej Europie. Składa się z 16 landów, które dzielą się na okręgi i gminy. Stolicą i jednocześnie największym miastem Niemiec jest Berlin. Jest to najludniejszy kraj w Unii Europejskiej i czołowe państwo pod względem gospodarczym i politycznym w Europie. W kraju tym obowiązuje konstytucja Republiki Federalnej Niemiec z 1949 roku. Pierwszym kanclerzem Niemiec był Konrad Adenauer, obecnie funkcję tą pełni Angela Merkel, natomiast prezydentem Niemiec jest Joachim Gauck. Władzę wykonawczą stanowi rząd i prezydent. Prezydent jest wybierany przez zgromadzenie federalne (wybory pośrednie) na 5-letnią kadencję i ma prawo do jednej reelekcji. Niemcy to państwo przedstawiające model kanclerski, dlatego też możliwości prezydenta są niewielkie. Ograniczają się głównie do funkcji reprezentacyjnych. Może on zawierać umowy międzynarodowe, ma prawo łaski, może rozwiązać parlament, jeśli nie wybierze on kanclerza. Każdy akt wydany przez prezydenta wymaga kontrasygnaty kanclerza i właściwego ministra. W kraju tym największe uprawnienia posiada kanclerz, który m.in. powołuje ministrów, szefa rządu, kieruje pracami rządu oraz reprezentuje go na zewnątrz. Rząd tworzy kanclerz, wicekanclerz i ministrowie. Posiada on prawo inicjatywy ustawodawczej oraz prawo veta ustawodawczego. Kanclerza mianuje prezydent, ale wybiera go parlament. Ministrowie ponoszą odpowiedzialność tylko przed kanclerzem, a odpowiedzialność polityczną przed parlamentem ponosi tylko kanclerz. Władze ustawodawczą stanowi dwuizbowy parlament nazywany zgromadzeniem federalnym. Składa się z dwóch izb; są to: Izba Związkowa (Bundestag) i Rada Związkowa (Bundesrat). Bundestag liczy min. 598 członków, którzy są wybierani w wyborach powszechnych na 4-letnią kadencję. Izba Związkowa m.in. : uchwala ustawy, kontroluje prace kanclerza i może go odwołać, ma prawo wprowadzania zmian do konstytucji. Bundestag liczy 69 delegatów rządów powołanych przez poszczególne landy. Są wyrazicielami interesów landów, z których pochodzą. Rada Związkowa ma m.in. prawo inicjatywy ustawodawczej oraz prawo veta wobec ustaw Bundestagu. Founded on 18th October 1922 by John Reith, The British Broadcasting Corporation (BBC) is the most famous British public service statutory corporation. This huge mass media corporation has its headquarters in London and runs its own television, radio and web portals. BBC runs 9 TV channels in the UK (BBC One, BBC Two, BBC Three, BBC Four, BBC News, BBC Parliament, CBBC, Cbeebies and BBC World News). On these television channels there are programmes for everyone. There are news broadcasts, TV series, movies of each kind, sport, lifestyle programmes, programmes for children, and much more. Each channel is really popular and has got a lot of viewers but the most popular ones are BBC One and BBC Two. 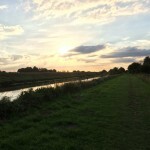 The domestic BBC television channels are broadcast without any commercial advertising and collectively they account for more than 30% of all UK viewing. The services are funded by a television licence. In Poland we don’t have any TV channels without commercials, so it’s something different for us. The BBC TV is really popular. It serves not only the area of the UK but also the whole world. There are some BBC channels available in many countries around the world. They are in English or in different languages, for example, BBC America, BBC Canada, BBC HD, BBC Kids, BBC Entertainment, BBC Lifestyle, BBC Knowledge, BBC UKTV, BBC First, and many more. These channels provide the latest news and many other programmes and films adjusted to the needs of local viewers (e.g. translation – dubbing or subtitles) from the UK’s television. In Poland we can watch BBC HD, BBC Entertainment, BBC Lifestyle, BBC Knowledge and Cbeebies in Polish and BBC World News in English. The BBC has ten radio stations serving the whole of the UK, six further stations in the „national regions” (Wales, Scotland, and Northern Ireland), and 40 other local stations serving some defined areas of England. One of the most popular radio stations is BBC Radio 1. It is a radio for young people that specialises in pop and rock music. We can listen there to the news and live music concerts, too. There is also BBC Radio 2, mostly for adults, which plays a wide range of music and also broadcasts news, talks and concerts. BBC Radio 3 plays jazz and classical music and is mostly addressed to artists and more sophisticated listeners. In BBC Radio 4 we can listen to the news, current affairs, arts, history, original in-house drama, original in-house first-run comedy, science, books and religion. Moreover, we can frequently listen to discussions on current social problems (e.g. a situation of Muslim women in the UK). And the last of the most popular radio stations is BBC Radio 5 live, where we can hear about sport, news and talk programmes. BBC Radio services are broadcast on various FM and AM frequencies, DAB digital radio and live streaming on BBC Online, which is available worldwide. They are also available on Digital Television sets in the UK. Besides playing music, BBC Radio has also produced a wide range of radio programmes in different genres. BBC News is the largest broadcast news gathering operation in the world. It provides news for the BBC Radio and television, but we can also read the news online on BBC’s website and in newspapers. The department’s annual budget is £350 million. It has 3.500 staff, 2.000 of whom are journalists. The main headquarters of BBC News is in England but each of the UK`s countries has got their own national news centre. All regions and nations produce their own local news programmes and other current affairs and sport programmes. There are also many BBC News’ centres abroad. They provide international news for England. Another BBC Service is a website BBC Online at www.bbc.co.uk. On this website we can read news, interviews and other articles and we can also listen to the online radio, watch streams from BBC television, watch and listen to all BBC programmes, watch photos from BBC’s events or other photos taken by BBC’s photographers, and, last but not least, we can learn online using BBC’s Learning Zone. So this service contains all other BBC services and it’s really useful – we don’t have to search for information on many websites – we have everything on one. BBC is a large corporation and besides running all the services described above it also produces its own big screen movies and TV series (among others my favourite one – “Sherlock”). It organises concerts and a lot of public events, has got its own orchestra and a group of singers and music producers, and, what is more, it has got its own cinemas where we can watch BBC’s productions. 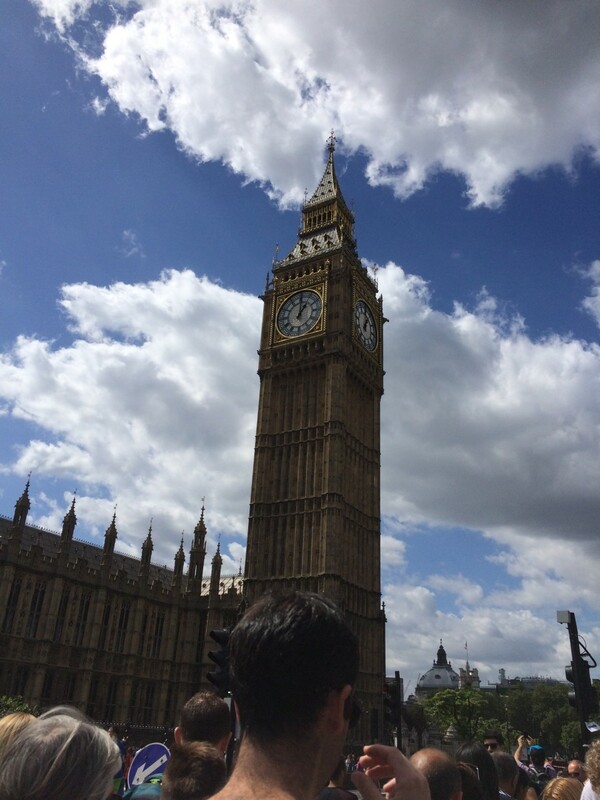 In my point of view, it is a very useful organization which can greatly increase our knowledge about the UK and its society and history. It is also helpful in learning English since all the journalists working for BBC use the so called RP – ‘received pronunciation’, which is the standardized version among all accents of English. Listening to BBC online can give us a completely different point of view on worldwide affairs, so that we can stay more open-minded and be more tolerant towards other nations. In conclusion, I think that BBC remains a top class news and art provider, which offers a superb range of film, music and other productions. Why should we all visit Greece? No sooner had I arrived at the Thessaloniki airport than I knew I had made the right decision to choose Greece as my holiday destination. Greece proved to be a fantastic country to spend my holidays in. The nearby sea shore looked spectacular and exquisitely blue, a warm breeze made me feel I was at the right place. Before I set off for Greece I had done my research. I had read about the culture, the people of Greece, the highlights, and, of course, about the food, which is very tasty and healthy. 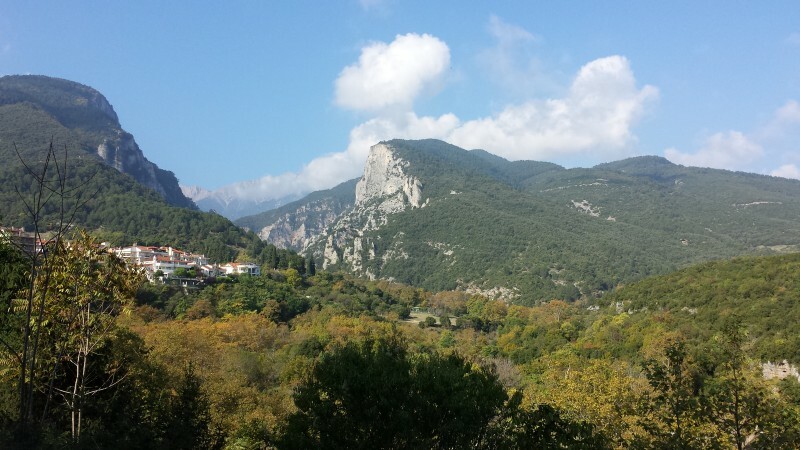 I had chosen Thessaloniki because I really wanted to see the mythical Mountain of Olympus. What I saw and experienced in Thessaloniki and around this huge city confirmed it had indeed been worth going there. First of all, the people whom I met and talked with were very friendly and helpful. I must admit that English is widely spoken there, which was a nice surprise I had not anticipated. Secondly, Greek cities seem very safe and clean. Each day in the morning I saw people hosing the pavements before their shops and restaurants. Greek people’s love for animals is also amazing. It looked like the whole cities and villages were cats and dogs sanctuaries. Since I am afraid of stray dogs at first I was scared seeing plenty of dogs and cats wandering around the city, but then I realised they were neither aggressive nor harmful. They live in the streets, are fed by people and live with them in symbiosis. Another matter is the cuisine, which is spectacular. Greece is known to be an agricultural country with lots of sunny days and clean water. The ripe tomatoes are red and juicy, and the olives taste wonderful. All those mouth watering meals are served everywhere at reasonable prices. No wonder why American fast foods do not exist in Greece (there used to be one McDonald’s restaurant in Thessaloniki once, but nobody remembers it now). Furthermore, it must not be forgotten that Greece is famous for its mythology and incredibly rich and ancient cultural heritage. It is the cradle of philosophy, sciences, literature, and drama, to name but a few disciplines of knowledge and art that originated here. The Greek nation is renowned for its long and fascinating history. If you see monuments here, you can be sure they are very ancient, which means at least 1000 years old or even older. The most famous buildings in Thessaloniki are Rotunda of Galerious (4th century AD), Hagia Sophia Church (8th century AD), Walls of Thessaloniki (4th century AD). The symbol of Thessaloniki is the White Tower, quite a young site in comparison with the other monuments, because it is only 500 years old. It is situated by the sea at the end of a very long quay. All these places are definitely worth seeing. In conclusion, Greece is a great place to visit for everyone without any exceptions. It is a friendly, tourist orientated country with a delicious cuisine, long sunny days and breathtaking sceneries. Its historical monuments are undoubtedly a treasure, which cannot be overestimated. I think this country will not disappoint anyone. If you are a car lover then you probably know just by the title what I am going to talk about. If you are not familiar with that name, let me enlighten you as much as I can. The Top Gear I want to bring you closer to is a BBC television series about motor vehicles. That version started in 2002 and has had twenty one seasons. Its formula is based on the original series form between 1977 and 2001 and the main part that attracts viewers and connects both editions is their host – Jeremy Clarkson. Some people may hate him, some people adore him, and I think I would consider myself as his fan. He is honest, sometimes brutal with his opinion, sarcastic, often ridiculous but you can’t practically pass him by and in my opinion this is essential in show business. Back to the topic: why might someone who knows nothing about cars and isn’t actually interested in them want to watch Top Gear? The answer is: because even though the show is supposed to focus on the news from the automotive world and to introduce the models recently released by both the most popular brands and the less known ones, it scarcely does. It is entertainment mixed with some information, which predominantly produces amusement, that is the key to Top Gear’s success. The formula of this show is neither strict nor boring. You can’t normally predict what will you see in the next episode. The three hosts of the series: Jeremy Clarkson, Richard Hammond and James May continually make fun of one another, call themselves names and try to outshine one another. They face various challenges and sometimes have to cooperate or compete. It is usual for them to do unusual things. Once when a sudden snowfall froze the unprepared UK they created and tested a snow remover made out of a combine-harvester. Another time James and Jeremy played a special rugby match in Kia’s cars, which was hilarious. On a different occasion they built their own off-road vehicles for the disabled ,and tried using them. Once Richard, driving a Skoda, raced along a man with a jetpack. Moreover, the three hosts travel a lot around the world so that we can frequently see wonderful views or get in touch with other cultures. In every episode there are of course less exciting parts, such as reading and commenting on some news, conducting an interview with a celebrity, and watching their best lap around the Top Gear test track, in “a Reasonably-Priced Car”. There is also a person that is really characteristic of this show, whose name is Stig. He always wears a racing driver costume which was originally black and now is white. He is an anonymous, never talks, and we can’t see his face. He has many “cousins”, for example the African Stig, the Chinese Stig or the Digital Stig. He completes a lap around the Top Gear test track to see the performance of various cars in the power laps segment. The show contains some specifically “British humor”, so I can’t really understand it but the audience is always laughing. It has plenty of special episodes, for instance “India Special”, where the trio visit India and try to improve its economic relation with the UK. 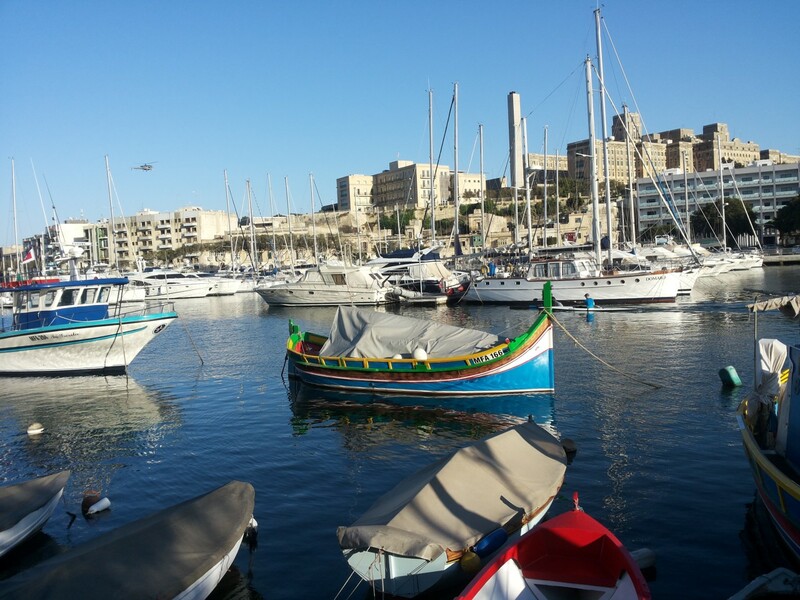 When travelling to Malta you must remember that it is substantially Roman Catholic but it is also home to a charming mix of cultures that have melted together over the past 7000 years. Since the first settlers had come from the nearby Sicily, traditional Maltese food mixes Sicilian cuisine with Middle Eastern flavours (the Phoenicians colonized Malta 4000 years later and brought along their Semitic language and culture), while drawing on local ingredients such as rabbit and honey. The Maltese are warm and welcoming and if I asked for directions it was more likely a local would walk with me to help me find the way. As for architecture, a lot of 21st century constructions can be found on Malta. They were built mainly after Malta had joined the UE in 2004. There are also places, however, where I felt I had travelled back in time. Geographically, Malta is located in the very centre of the Mediterranean. This location had historically given it great strategic importance as a naval base, and a great number of nations, including the Romans, the Vandals, the Normans, the French, and finally the British, used to control the archipelago. They all had ruled the islands leaving behind significant signs of their dominance. The capital, La Valetta, for example, was built by the Knights of St John, so it has a harmonious check pattern of streets, whereas Mdina and Victoria are fortress-like hilltop towns founded by the Phoenicians . 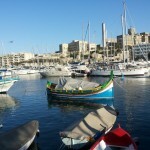 Even Malta’s famous fishing boats are connected with the past, as their prows painted with eyes recall the boats of their Phoenician predecessors. 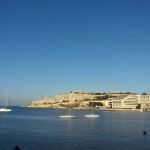 Not only is Malta packed with top tourist attractions but is also very easy to travel around. A lot of buses just for 1,50 EUR a day constantly circulate from their base in Valetta to the most remote places on the island. 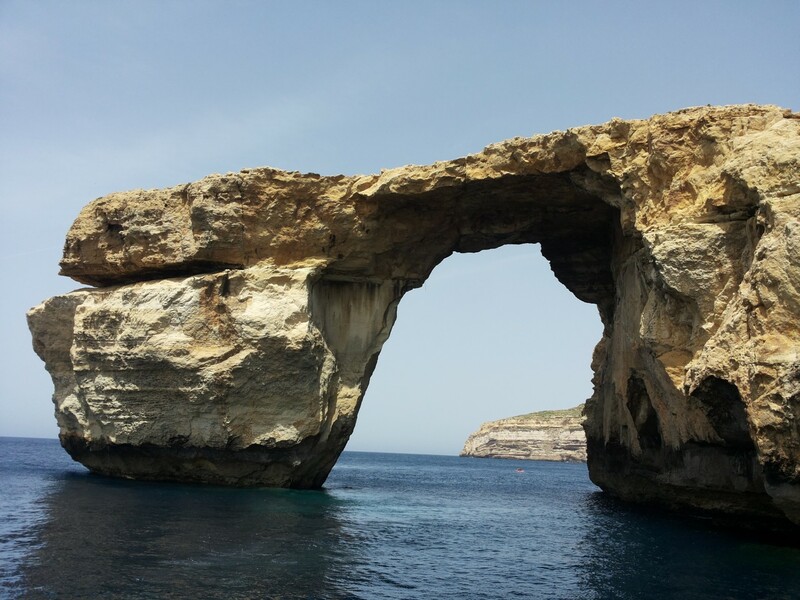 Gozo has got the same system, so just after a 30-minute crossing you reach the peaceful island with Blue Grotto and Dwejra Tower. 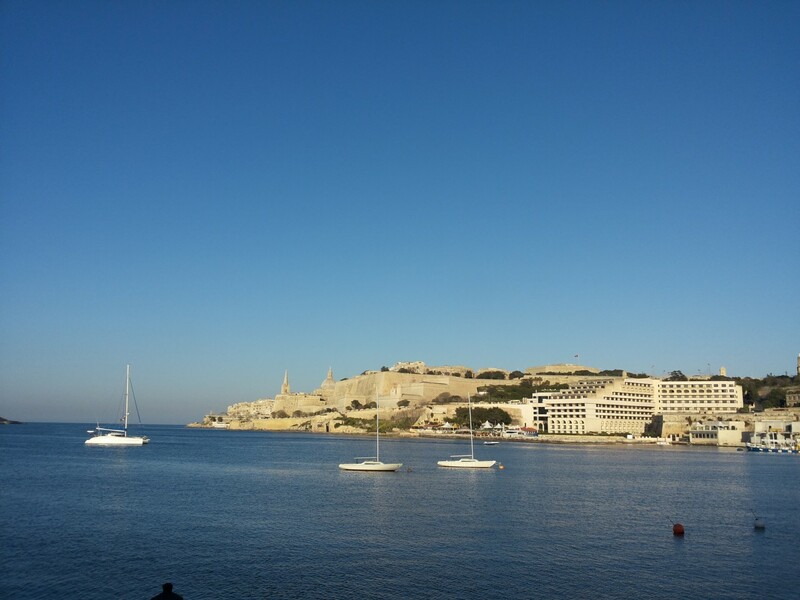 Malta has got a wonderful climate with hot summers and mild winters. It is well-organized, modern and tourist-oriented. Moreover, it cherishes its historical sites. This combination makes it an ideal destination for people of all ages. 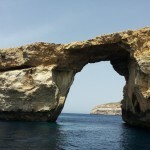 On Malta everyone will find something captivating for themselves. When I read books I usually seek adventures that help me escape from reality and completely forget about myself. I fall in love with fictional characters and their worlds, which vicariously become my own. However, from time to time I also feel the need for something relevant to my life, that can be translated directly into my every day experience. For example, allegories are stories in which events and characters represent ideas or teach a moral lesson. I have recently read George Orwell’s Animal Farm and it is definitely one of great allegories of modern times. It shows the truth about human nature, which, unfortunately, appears shameful. The allegory partakes also of a beast fable, as it illustrates human qualities by means of animal characters, and this way it drives its message home. Animal Farm is an allegorical and dystopian novella by the famous British author George Orwell, first published in 1945. It begins with a brief introduction of Mr. Jones, the owner of the Manor Farm, which is where the action takes place. Jones is a drunkard who doesn’t care for his animals’ well-being and is cruel towards them. When the night comes the mistreated creatures gather in a big barn, and an old, wise, respected pig named Old Major describes his dream. He tells about the utopian world he has seen, where there is no man, portraying human race as the root cause of all evil and torment. He also predicts the Rebellion, which is the day the man is overthrown. A few days later he dies but his inspirational words live on and finally the animals get rid of Mr. Jones by chasing him off the Manor Farm, which changes its name to Animal Farm. The newly freed creatures agree on a set of rules they have to follow from now on, which they call “The Seven Commandments”. They start their new lives trying to function as a small society. Knowing the bitter truth about society that it can never be perfect and that there will always be someone who will try to take advantage of others, the plot was actually predictable to me. However, that did not stop me from reading the book with interest. The story is hardly comforting but it proves educational, for it makes you question many fundamental things in life. Orwell’s novella shows how easy it is to manipulate people step by step. Aware of what is happening, the reader gets frustrated when witnessing the characters’ gullibility and lack of realization of how cruelly they are being abused and deceived, but this is exactly the point. You do not need to think about the government, politics, global economy and big conspiracy theories, for the message can also be applied to everyday life. It is a simple example of the power of words and mind games which may catch you unawares, for instance in personal relationships. In my opinionAnimal Farm should be read more often, especially by young people. It can be a real eye-opener. If you long for lying on the beach and having a bath in the waters of the ocean, catching some suntan in the middle of December and still want to feel as if you were in Europe, then there is no better place than the Canary Islands. Geographically and literally they do not belong to the Old Continent, but yes, they belong to the European Union. 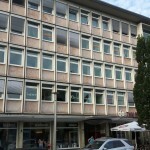 You can pay in euros, cross the border with your identity card only, and be sure, that you don’t have to take special precautions to move around. The Canaries became a colony of Spain in the 15th century and have been one of its provinces ever since. The first settlers were the craftsmen from Andalusia and they set up a town Vegueta. 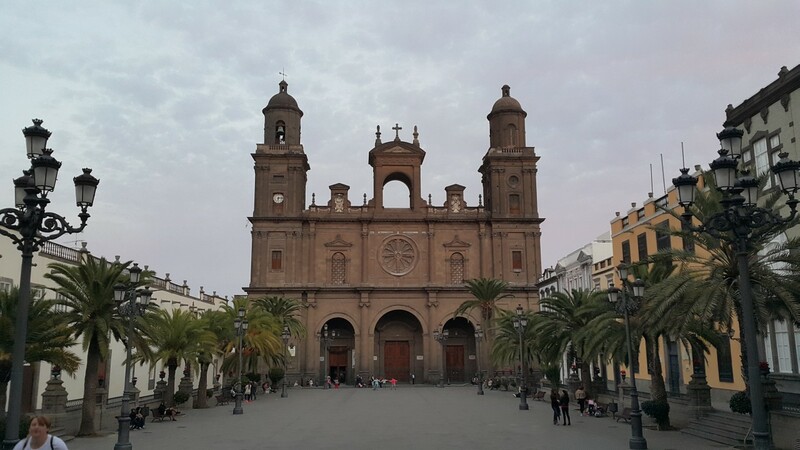 Today it is a part of the capital city of the Province – Las Palmas de Gran Canaria. How do I know it is a perfect place for holidays in December? Well, I had a chance to experience its bliss and it was really fantastic. There are several islands that belong to the Archipelago: Gran Canaria, Tenerifa, Lanzarote, Fuerventura and some smaller ones. I visited Gran Canaria, but I know that the same rules apply to the other ones. The climate is perfect: neither too hot nor too cold, and the temperature is almost the same in summer and winter. In December it was 28ºC, and during the summer it reaches 32ºC. It is so because of the oceanic current that flows just around the Islands. The climate in the Archipelago is really mild and friendly all year round. The language spoken on the Canary Islands is Spanish, of course, or more precisely „castillano”, but you can easily hear that their accent is slightly different from the one spoken in Iberia. All car plates bear the letter E next to the European Union flag. Only the weather and the surroundings (typical of any volcanic island) tell you that you are somewhere else: not exactly in Europe. 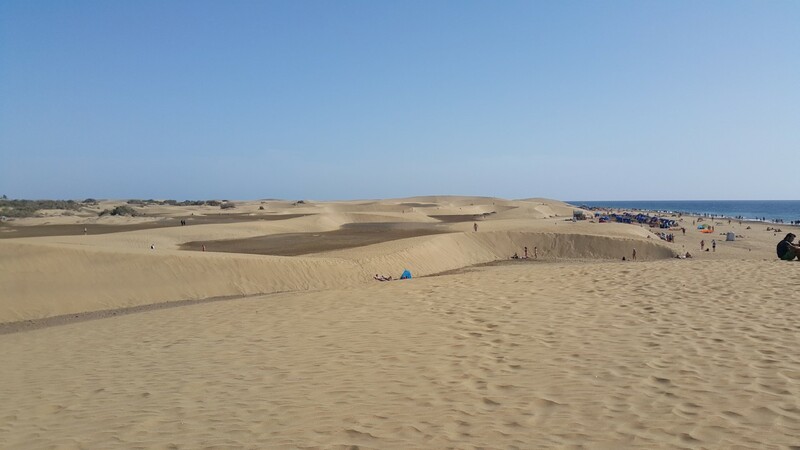 When holiday-making on Gran Canaria, you must see the Dunes of Maspalomas: an absolutely fantastic nature wonder. They have been a nature heritage since 1994, which meann that no hotels can be built in the area. The sand that creates the dunes does not come from the nearby Sahara. It was brought by the ocean. The dunes and the salty lagoon make a spectacular view which is undoubtedly worth seeing. 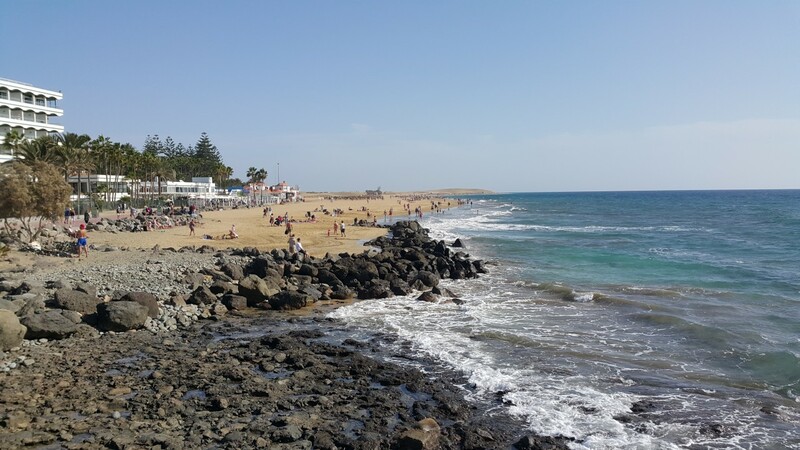 A walk along the beach from the oldest lighthouse on the island (built between 1860 and 1890), the Maspalomas Faro, to the Playa del Ingles is a must. A top tourist attraction is also Vegueta with the oldest cathedral on the Island, Santa Anna Cathedral, but if you don’t feel like sightseeing you can always lie on one of the numerous „playas” scattered around the coast, where you are carefully watched by lifeguards. All the same, whether you’re alone on the road or on the beach, you feel perfectly safe and well served in that paradisiacal European archipelago. Excelling at a new language can be a challenge and I learnt it quite recently, when I started taking German seriously. I had known since secondary school that I needed it in order to pursue my dream of going to a certain university but it seemed surreal until high school. I guess I thought I had enough time. Becoming rather fluent in English was a natural process, never rushed because of some deadline such as A-level exams. At no time was it the centre of my attention and I don’t recall putting much effort into it. I just used to watch a lot American TV-series without subtitles or dubbing, which left me clueless about how difficult learning a foreign language might be. I wasted my time in secondary school and even though I was a top student I didn’t acquire satisfactory knowledge of that subject, nor the basics necessary to continue learning. I tried to catch up but my skills were not sufficient, no matter what. I couldn’t imagine writing the exam and gaining at least half of the points. Regardless of that, a sinking feeling of panic didn’t sweep over me: I had an ace up my sleeve. I have a close family that has been living in Germany for over 20 years now. 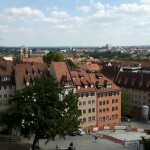 My aunt, uncle, and cousin settled in Nuremberg a long time ago. I think it’s a wonderful place that is not too busy but still quite big and having plenty to offer. My family agreed to take me under their wing for a whole month last August. My aunt had found a language school in the city centre called “Primus” and having consulted my parents she signed me for an intensive course. There were many things I was nervous about in regard to my stay in Germany but I didn’t give up because of my fears as I usually tend to do. The first thing was using the subway on a daily basis, but it turned out not to be scary at all, and, in fact, and very comfortable. I fell in love with its punctuality, as it was always precisely on time probably because it was run by a computer and had no driver. Secondly, I was afraid of the new people who, as I supposed, couldn’t speak any language that I spoke and understood well. 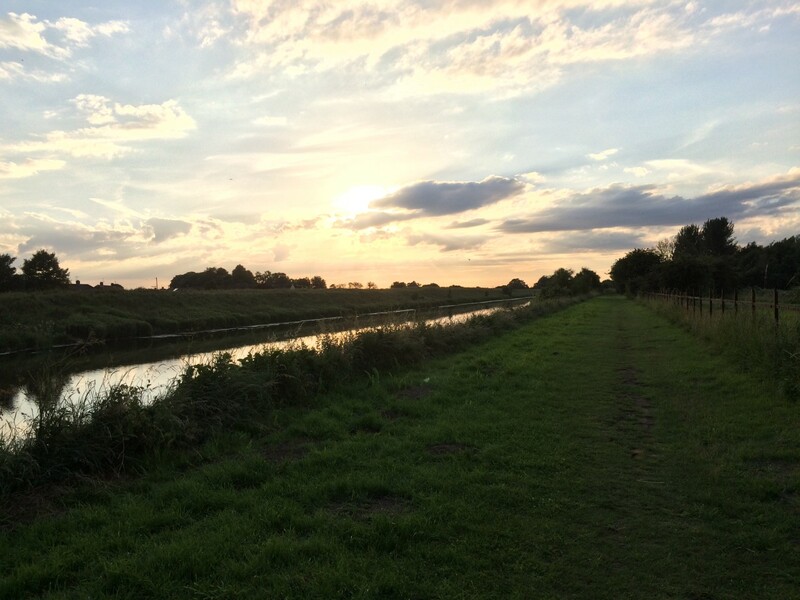 Thirdly, I wasn’t sure about the difficulty of the course. My aunt and I decided that I should try the B2-level, knowing it would be easy to change groups if I couldn’t manage. My first day was extremely hard for me. I remember myself on a verge of crying when I couldn’t understand a single word when right before the first lesson my cousin was talking to a lady from the office. I was supposed to sit in the classroom with three other girls and do the same exercises I was handed until the teacher came. I was too scared even to introduce myself to the girls and they weren’t talkative, either. I just sat there all alone and forlorn, and tried to focus on my task. It was quite a shock, like a jump into deep water, to be surrounded only by a language that I barely knew and by means of which I was unable to communicate. I started to read the exercises and did my best to complete some of them. I became calmer when I realized I was able to get some answers. Then I noticed that the other girls were using dictionaries on their phones, and I, having no Internet access, was still able to catch up. It boosted my confidence a little bit and cheered me up. The teacher finally came and she was so incredibly nice, like a ray of sunshine, that I immediately fell in love with her. I decided to stay in the B2 group. I had 5-hour lessons with only one 20-minute break from Monday to Wednesday, and a 3-hour lesson on Thursday. 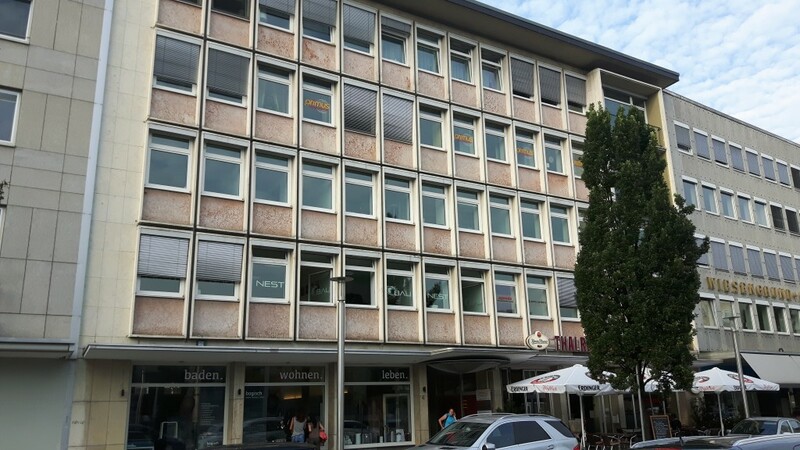 The first week was my time to adapt and get used to hearing, reading and speaking only German for such long periods of time. It was exhausting and difficult. Every day I asked myself if I could really do it and whether I belonged there. Soon, however, things were to change for the better. After a while a boy from China joined us, and he couldn’t speak German much better than me, if any better at all, and I didn’t feel so out of place anymore. During my second week I became more comfortable and something “unlocked” in my brain, thanks to which I started to understand much more. I even spoke to the lady in the office and bought the books I needed for the course myself. Meanwhile some other people joined the group and I got along with them very well. Everyone was around my age. Only Nicole, a girl from Romania, was a little older. A boy named Danilo came from Columbia. We liked each other immediately and worked together a lot. Buka was from Mongolia, Preti from Nepal, and Mia from Vietnam. Sadly I can’t remember the Chinese boy’s name because it was hard to understand. I couldn’t see it at the time but my command of German was improving rapidly. After the second week the teacher would often compliment me, as she was happy and glad that I was making such progress. When it came to understanding grammar I was apparently the only one managing to do the most complicated exercises. We were working so much on long texts suited for quite advanced students and I had fewer problems with them day by day. Interestingly enough, I was also the only one who wanted to go back to my homeland. Everyone else was to stay in Germany to work or study, so the course had to be very intensive. I got to know everyone and enjoyed talking to all my groupmates. They were surprisingly nice. I’m always scared of meeting new people but that experience showed me that I shouldn’t be. I’ve learnt so much not only regarding language but also other cultures from around the world. We talked a lot about our countries. The teacher, curious of what we wanted to say, always encouraged us. I was able to share many things about Poland and not only did it make me proud but also homesick. I got to appreciate Poland more because I lived abroad for over a month. Now I know from my personal experience that the grass is not always greener on the other side of the fence. 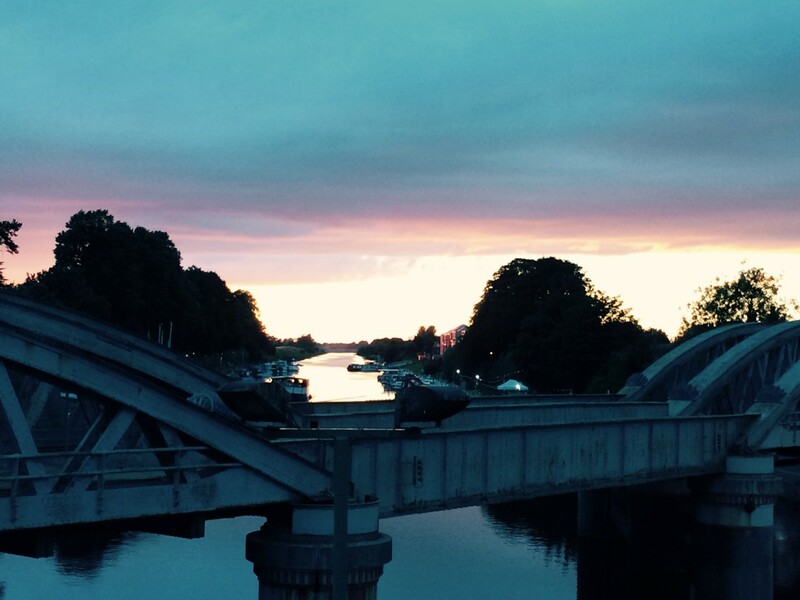 All in all, the German adventure has given me a lot more than I had anticipated. I am so grateful that I was able to experience it. 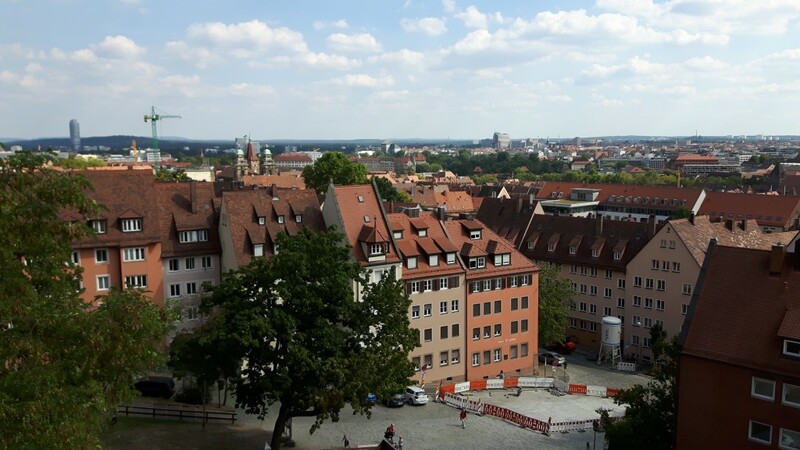 The monthly German course in Nuremberg will be among my best memories, which I will always cherish, not only from the linguistic point of view. Polityka, dyplomacja, ekonomia, prawo: Uczelnia Sciences Po, czeka na was!